Make this New Years Time Capsule an annual family tradition! A great family activity for New Years Eve, and it sure beats watching the ball drop! 1. Wrap an old box with wrapping paper. Wrap the lid and the bottom of the box separately so that you can lift the lid on and off. 2. Decorate your time capsule with embellishments you have around the house. What is ours decorated with? 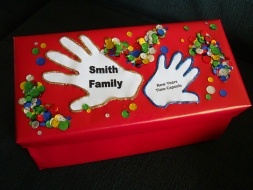 We printed out "Smith Family" and "New Years Time Capsule" on a white paper from the computer and traced the kids handprints over the writing. We traced them with glitter glue and added some extra glitter and sequins to our box. Be creative! 3. On New Years Eve fill your box with treasures. Have the children write stories or draw pictures, you'd be surprised how much these skills change after a year! Fill it with memories from the past year and store it safely. 4. Next New Years Eve take your time capsule out and take turns reading and sharing last years treasures, and then get busy and fill your box again for the next year!